Have you decided on your holiday card design yet? If not, then you might want to check out the handmade greeting cards on the website. 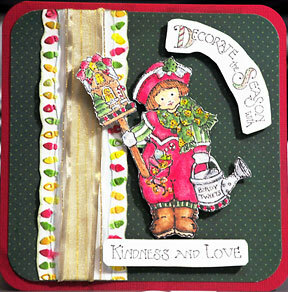 There are two new holiday cards added to the website with simple step-by-step instructions. You can upload your handmade cards to the website. Now you are able to upload multiple photographs of your handmade greeting card or variation of your card design. Please do write at least a paragraph on the cardmaking supplies and techniques used to create that card(s). This will enable viewers and searchers to find you and comment on your handmade cards. I will greatly appreciate if you will share your card on the appropriate category. Example, birthday card in the Birthday Card category and wedding cards in the Wedding Cards category. And please do not post anything that's not about cardmaking. Any inappropriate upload and post will be removed. Thank you for your co-operation. So just go here to upload and share with us. Making Greeting Cards has launched a Facebook page where we can connect with one another and share cardmaking techniques and ideas. You can also upload your photos so that we can see your creations. To share, follow Making Greeting Cards. Finally, to you and yours, have a creative day everyday. Copyright ©2004 - 2010 Heart to Art, All rights reserved worldwide.